Dr. Rica Salmon Bogdany, MD is a Doctor primarily located in Clermont, FL, with other offices in Winter Garden, FL and Kissimmee, FL . Her specialties include Family Medicine. Dr. Salmon Bogdany is affiliated with Orlando Regional Medical Center, Osceola Regional Medical Center and Florida Hospital Celebration Health. She speaks English. The overall average patient rating of Dr. Rica Salmon Bogdany is Great. Dr. Rica Salmon Bogdany has been rated by 18 patients. From those 18 patients 7 of those left a comment along with their rating. The overall rating for Dr. Rica Salmon Bogdany is 4.3 of 5.0 stars. Dr B gives people their lives back! Being a mother of young children, the pain not only physically I endured from having a major accident, but the pain in the heart - from not being able to be the hands on mother that you once were- was tortious. That is until seeing Dr B. - She not only gave me back the quality of Life I desire, she gave my beloved family their Mommy back <3 There really are no words that can describe how appreciated and valuable Dr B is to so many of us who have experienced life handing them a not so kind card. Bcs of her this World truly benefits in a way that is uplifting, making shattered dreams into a beautiful mosaic of possibilities. Dr. B is extremely reliable. I love how much attention to detail she shows. Shes always so careful and meticulous. It is so refreshing to have a doctor who truly cares about me and my health as a whole person. After being shoved from one doctor to another by MDs that just didnt want to deal with a complicated and unresolved history it is hard to put into words how relieved i am to have her in my life. I never have to worry about her making a mistake or forgetting something, she really takes the time to figure out what's going on with my body and educate me about how we are going to work together to achieve healing and my best health. She has never made me feel uncomfortable for asking any question. Dr. Bogdany is rare find and an excellent doctor. My experience has been that she is conservative and does not over-prescribe medication. I can honestly say Dr. Bogdany gave me my life back. I have been having problems since my accident in 1996 and have seen different doctors to no avail....Since I've been seeing Dr.Bee I can work again, and have a regular life like I have missed the last 10 yrs. These last 3 yrs. have been a Blessing to have her as my Doctor and I wouldn't have another one but her...Period!! Dr. Salmon Bogdany is affiliated (can practice and admit patients) with the following hospital(s). We are sorry, it looks like we don't have insurance information. Please call Dr. Rica Salmon Bogdany's office for more information. 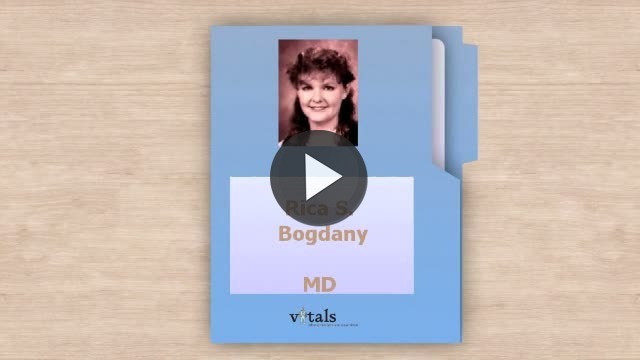 Take a minute to learn about Dr. Rica Salmon Bogdany, MD - Family Medicine in Clermont, FL, in this video. Dr. Rica Salmon Bogdany is similar to the following 4 Doctors near Clermont, FL. Dr. Rica Salmon Bogdany Is this you? Have you had a recent visit with Dr. Rica Salmon Bogdany? Select a star to let us know how it was.